OBJECTIVE(S): Endoscopic treatment has become an accepted option for early stage esophageal cancer. The purpose of this study was to explore nationwide trends in treatment and outcomes of T1 esophageal cancer. METHODS: T1N0 esophageal cancers were identified in the National Cancer Database from 2004-2014. We assessed trends in treatment; compared endoscopic therapy, esophagectomy, chemoradiation, and no treatment; and performed a subgroup analysis of T1a and T1b patients from 2010-2014 (AJCC 7). RESULTS: 12,383 patients with clinical T1N0 esophageal cancer were analyzed. Over a decade, use of endoscopic therapy increased from 12.7% to 33.6%, while chemoradiation and esophagectomy decreased (Figure, p<0.01). The rise in endoscopic treatment of T1a disease from 42.7% to 50.6% was accompanied by a decrease in esophagectomies from 21.7% to 12.8% (p<0.01). For T1b disease, the rise in endoscopic treatment from 16.9% to 25.1% (p=0.03) was accompanied by decreases in no treatment and chemoradiation, while the rate of esophagectomies remained 50%. Risk-adjusted Cox modeling showed esophagectomy was associated with improved survival (HR: 0.85), and chemoradiation (HR: 1.79) and no treatment (HR: 3.57) with decreased survival, compared to endoscopic therapy (p<0.01). 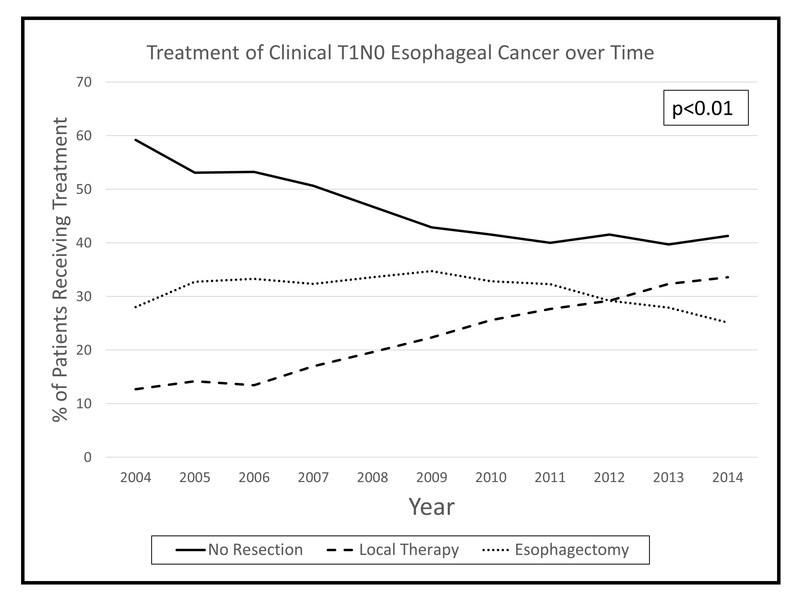 CONCLUSIONS: Use of endoscopic therapy for T1 esophageal cancer has increased significantly: for T1a, as an alternative to esophagectomy; and for T1b, as an alternative to no treatment or chemoradiation. Despite upfront risks, long-term survival is highest for patients that can undergo esophagectomy.